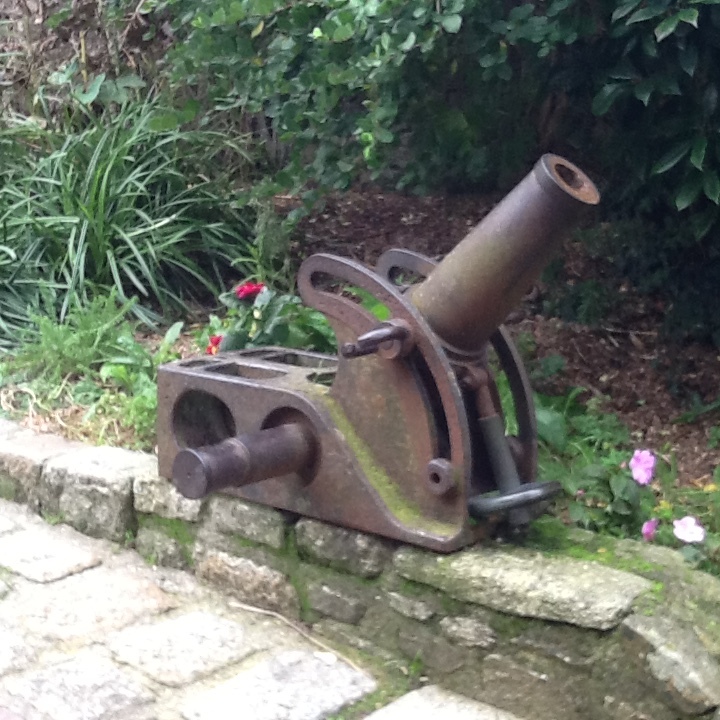 It’s a fair bet that no US reader examining these photographs will recognise this World War I trench mortar. It’s one of the standard Allied types of the war, used all along the Western Front, and in other theatres. Some 3,300 were manufactured at Saint- Etienne between 1915 and the end of the conflict. The first example shown here, stands under the clock tower in the old walled city of Dinan in Brittany. It’s been stripped of the heavy back plate and forward carrying lug plates, though somehow it survived the following war, and is now over a century old. The second photo I took at a War Memorial in Guerlescin, again in Brittany. Many of the “58’s” that survive are used in memorials across France. This example is more complete, but you can see how heavy these mortars were, some 850 pounds ( 417kg) or so in all. They threw six or seven types of bomb, on a rod inserted into the barrel. These were shaped like aircraft bombs, with fins and were some three feet long overall. The lightest bomb was 34 pounds, and the heaviest 90 pounds. The range varied according to the bomb, from 400 yards up to 1,200 yards. It must have had a strong recoil, as the plates were inevitably bolted to heavy timbers and sandbagged. Interestingly, the French Army were not the only users of the Mortier de 58T No. 2. A few dozen found their way into the hands of the Serbian Army, for use in the Balkans, and a small number were given to the Greeks who used them at Salonika. However, several batteries of the mortar were provided, along with much other materiel, to Pershing’s American Expeditionary Force, and the American army used them until the war’s end. 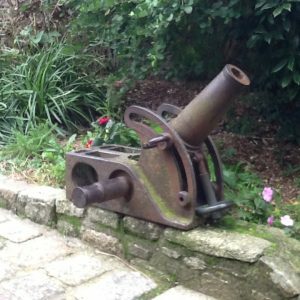 General Guy Francois’ “Les Canons de Victoire 1914-1918,” published in 2000 in Paris, gives greater detail of the mortar. It’s possible that an example remains in the hands of a US Military or Ordnance Museum, or even a photograph of one in AEF hands. Some French arms were taken back to the USA for training use post-war, I believe. Anyone have any information on that? This entry was posted in Periods - World War I. Bookmark the permalink. I’ll take that bet. The US company Old Glory seems to know about it as they make one in 28mm. I recognized it immediately. My French troops are complete with one. Oddly enough, I hoped someone would come up with a source for this under-rated and, in wargames terms, remarkably useful little mortar, and Mr. Krebs is to be congratulated on finding it on the other side of the pond! Has he, I wonder, found any photographs or text which covers its use by General Pershing’s army? That’s what I had really hoped someone would come up with, given that almost all of the trench weapons, ordnance and most of the heavy mg’s used by the AEF were either French or British manufacture. The Old Glory device looks from the photo in the company’s catalogue to be rather on the thin side, and would need the addition of a heftier base, as well as having options for the ‘bomb.’ Is that fixed, I wonder? 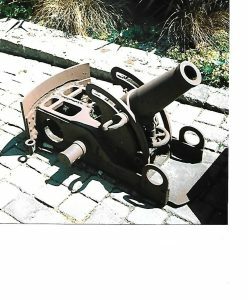 I also wondered if the company manufactured either a British or American mortar group as options for crewing the ‘Crapouillot’ (the ‘little toad’) as French Poilus nicknamed the mortar. Until last week, I had no correspondence on any wargame source of the 58T-2, but then my colleague Geoffrey Hall brought one of the Britain’s 1/32nd (54mm) WWI range sets to my attention. Set ID 23108 is a 1917-18 58T-2, which looks remarkably accurate, and this has an American ‘Doughboy’ team of two. Unfortunately, this is also very expensive at £80+ and clearly intended as a collector’s item.